Drive Growth with Smarter Association Software that includes built in sales funnel management. Keep Members Engaged. Keep Members Longer. "Great AMS System for a Reasonable Price!" We've been using GrowthZone for about 8 months now. We had WildApricot but it did not meet our needs and was not as user-friendly as we needed. We found GrowthZone just in time! It is a reasonably priced association management solution to an association's database and website. The web platform is great and easy to use as well and I was not a web manager before...now I am because it is that easy. It puts a great face on your association. I have worked with higher-priced solutions (iMIS) and GrowthZone has all the features and more that our association needs. We did the due diligence so you don't have to! We are an association management company who manages two different affiliates so we purchased two systems for each affiliate/entity. All the questions during the sales process were answered appropriately to help us make our decision. Taking the courses at the beginning helps to get to know the system. There are some minor restrictions but, for the money, it is a great product with many options. It's very forgiving. The live support is not the best but I can usually figure things out on my own when you try different options. There is a great wiki area where you can find answers to your questions and videos, examples. If you are a trade or professional association, this is the product for you! It does pretty much everything you need out of the box. No customization needed. We have now gone all online for registrations, memberships, donations. We have history now in our system where we were doing everything in real file folders. A lot less paperwork and a great time saver! The members are really liking the Member Information Center to manage their own records and perform financial transactions securely with the association. "ChamberMaster saves us time and money"
GrowthZone's ChamberMaster product has simplified our staff's work AND saved us money. We use most, but not all, the features allowing us to keep all our member information in a single, online place. We can access member info, event details and our credit card processing everywhere we go. There's a learning curve simply because ChamberMaster has so much to offer. I recommend new users start with all the basics and add features as time and budget allow. Watch and re-watch the many training tutorials. Then ask the CM staff any questions you have. Don't struggle through something you don't understand. We're a PRO V9 customer using many, but not all, the features. I encourage every chamber to use an online software tool, and start by looking at GrowthZone's ChamberMaster product. It makes sense to make your work life easier. We have a staff of two so we use ChamberMaster to make life easier. The online tools make it easy for members to add/update info so our staff doesn't have to. Event registration is a breeze and the integrated credit card processing saves time (for our staff and our members) and enhances security. "User Friendly but Lots of Issues"
Invoicing has become a great deal easier with GZ, from the standpoint of being able to email invoices to our members. I also like that members can access their own account through the HUB - this allows them to see their billing history, event registrations, etc. Experienced lots of issues with GZ syncing correctly with BillHighway and NAHB; thus, causing major issues with our database information. The reporting is incredibly difficult to grasp and many of the reports do not function correctly. Because we moved from HAMMERS, which was an Access database, the transition was very difficult. Be prepared for lots of "cleaning up." Invoicing is easier. Member access to their own accounts has made things much nicer for our members. We're very sorry to hear of your issues with GrowthZone. The BillHighway/Dues Hub functionality is unique to home builder associations. This feature is very new and considered "beta." We continue to work closely with our partner, Bill Highway, to address these issues. Along with that, we are improving our WMS export functionality in case that is a better fit. Again we apologize for any trouble you've had. Please know our support team is always available via chat, phone or email to help you. We love Growthzone! We have a new employee and she cannot say enough about it. She came from another Association and she said this is the best system she has worked with. It has simplified our lives and streamlined so many tasks. From dues invoicing, events, name badges, on site payments using integrated payment processing to the members database and member information center where members can view their accounts, pay their invoices, see what events and programs they have attended. It all works seamlessly. They also duplicated our website that we had just launched. Mobile apps are awesome. nothing. If I had to come up with something it would be that we don't have an Auto-Member Roster that prints out by member type. We have to export the data and format the roster. At the Farmville Area Chamber of Commerce we have been so pleased with all aspects. The social media updates, video education updates, customer service and more are what keep us as loyal customers. They are quick and responsive and always happy to hear suggestions. There isn't really anything that I don't like. We are very happy customers. Membership management can be so tedious and tricky. GrowthZone offers so many different options and reports. It makes my job easy when a client asks a question and I can quickly search and get the answer to them. 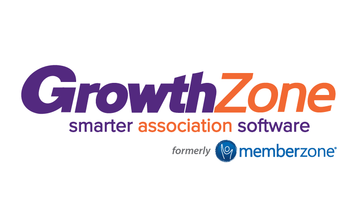 "Best association software on the market"
GrowthZone is liking having another person working in our office! It cuts down on so much paperwork and helps us run our association much more efficiently. I wish we had the ability to duplicate invoices. Hands down the best software! We switched from a spreadsheet database to GrowthZone, but many associations that I know have switched from other software companies and also agree that this is the best! It combines all of our events including registration and billing as well as membership. Having it tied to Facebook is also a real plus. The benefits are endless. I can't say enough about this software and the customer service is top notch. "User friendly and efficient system"
The layout is very straight forward, easy to use and well organized. Easy to access and update member information, contacts and profiles. Event management is made easier with registration lists, member sign-up and for storing detailed event information. Additional training is always available through webinars etc. It would be fabulous if it were able to integrate with Event bright! "Although New (V10), Still Great!" The ease of finding information in the database. It is new, so many things need to be developed as we go. This poses some issues and delays in getting work done, but it is a learning process. If you have patience, it will be an amazing system. Switching any database system will be tough, you just have to see it out through the end. Needing a more robust AMS. We can now find so much of our information at a much quicker rate. Growth Zone provides out trade association with one of the best membership databases available. It is easy to use, provides a tremendous number of applications, and the customer service is outstanding. There are tons of applications, lots to know and learn how to use all of them. "We’re very pleased with our choice of GrowthZone as our membership database. " Some of the features are too basic and need to be expanded on. Our membership listing on our website is always current. Members contact information is accurate since members have the ability to update their own information. The backend is useful for both website content managers and administrative staff. I wish there were more options to customize the look and feel of the site. It is nice to streamline content and backend data into one platform. It has saved time on switching between software packages. * We monitor all GrowthZone reviews to prevent fraudulent reviews and keep review quality high. We do not post reviews by company employees or direct competitors. Validated reviews require the user to submit a screenshot of the product containing their user ID, in order to verify a user is an actual user of the product. Hi there! Are you looking to implement a solution like GrowthZone?